Crime Scene Photos hidden from the Defense in Rankin County Mississippi resulted in the wrongful conviction of Michael Lindsey for murder. Believe it or not, this is not the alleged murder victim. This is Michael Lindsey, as the Pearl Mississippi Police Department photographed him when they arrived on the scene. On July 27, 2008, when officers of the Pearl Mississippi Police Department arrived at Trailer 303 in the Oak Lake Trailer Park, this is what they saw. This is a crime scene photo taken by the police of this man lying unconscious and bleeding on the cement slap at the entrance to the trailer. This bloody photo is not the photo of the man who died, David Knapp. 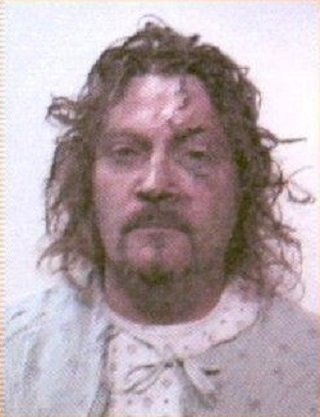 This is a photo of Michael Lindsey, the man who David Knapp viciously attacked at Lindsey’s home. Earlier that evening, David Knapp, a 32-year-old, 261-pound male came to the home of Michael D. Lindsey armed with a 12-ounce beer bottle. He was accompanied by his girlfriend, Shannon Few, and another neighbor’s son, Steven Booth. He was yelling “I’m gonna kick the motherfu*ker’s a$$. The police report of Hugh Johnston confirms that David Knapp arrived at the home of Mike Lindsey, banged on his door, and called him outside. Then Knapp broke the beer bottle over Lindsey’s head and stabbed him repeatedly in the face with the broken bottle. This caused multiple life-threatening injuries to Michael Lindsey. Knapp was 16 years younger and 80 or more pounds heavier than Michael Lindsey, and he was able to do significant damage to Lindsey. After the aggravated assault by Knapp, Michael Lindsey begged someone to call 911. According to witnesses, his roommate, Reggie Tisdale, refused to call 911 because he did not want anyone to go to jail. Bleeding profusely and unable to find his phone, Michael Lindsey knew that he had to get medical attention. When Michael was able to escape his attacker, he went inside his home looking for his phone to call 911. Michael looked out his door while searching for his phone, and David Knapp was still just a few feet from his front door with his arm around Reggie Tisdale (Michael’s roommate and best friend since childhood). It appeared to Michael that David now had Reggie in a headlock and was attacking him. Michael picked up the only thing visible to protect his roommate and himself from this violent attacker, a kitchen knife laying on the counter. He walked outside and stabbed David one time. Unfortunately, David died from internal blood loss due to this single stab wound while it took 40 minutes for American Medical Response to arrive. 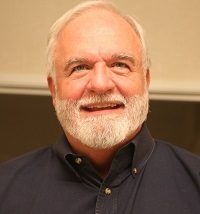 David Knapp wasn't murdered. He died as Michael Lindsey defended himself against a vicious attack. The police report done by Corporal Patrick Walker confirms that when Michael Lindsey came back outside, the fight began again, and this is when Knapp was stabbed. Michael Lindsey never left his property. He had a right to eject a trespasser who had committed an aggravated assault on him by meeting force with force. Michael Lindsey's injuries included stab wounds to the face and forehead, lung injuries, as well as two broken ribs and two large chunks of hair pulled from his head by the much younger and stronger Knapp. He had a large hematoma with 2 cm. 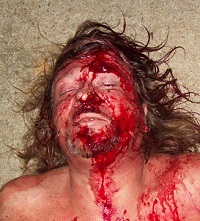 laceration on his forehead; multiple lacerations to the face. The most severe laceration was under and coming up the left side of his nose; it was 4 cm. full thickness with a 1 cm. laceration into the gingival. The hospital had to pick pieces of glass out of the roof of Michael Lindsey’s mouth. He had a large hematoma on his left flank (side); two broken ribs; and partial collapse of both lungs. This is all shown in the medical records. The medical records of Mike Lindsey indicate that the stab wounds to his face required many stitches to close multiple stab wounds (at least 50 stitches). Michael Lindsey was bleeding profusely, and his face and chest were covered with blood, according to the police report of Carlton Pagan. In Mississippi, citizens are supposed to be protected from prosecution by Mississippi’s ‘Stand Your Ground’ Castle Doctrine Law in the event they have to defend their life or the life of someone else. But in the case of Michael Lindsey, the local police department, the prosecutor’s office, and the judge in Pearl/Rankin County flat out refused to acknowledge the felony aggravated assault resulting in multiple life threatening injuries that was committed on Michael Lindsey at his front door. Michael Lindsey is in the Central Mississippi Correctional Facility in Pearl Mississippi. He was found guilty of murdering David Knapp. The crime scene photo above of Michael Lindsey, unconscious and bleeding profusely, was withheld from the defense. Michael Lindsey’s attorney was unable to describe Michael’s condition to the jury because Michael was unconscious and had no idea what he looked like. He was unable to show the jury because the prosecuting attorney withheld this crime scene photo from the defense. The wrongful conviction of Michael Lindsey and the prosecutorial misconduct is one of the stories that will be featured in Lawless America…The Movie. As of today this felony attack committed on Michael Lindsey has not been acknowledged by the Pearl Mississippi Police Department, the Rankin County District Attorney, or Rankin County prosecutors. In addition, the accomplices to this felony have not been held accountable for their part in this crime. In fact, accomplices in this felony crime were the prosecution’s witnesses against the victim, Michael Lindsey. Officials have intentionally gone above and beyond to ignore this felony crime in order to prosecute the victim of this felony who should have been protected from criminal and civil prosecution by Mississippi’s ‘Stand Your Ground’ Castle Doctrine. When the defense attorney asked the prosecutor face-to-face when he was going to acknowledge the felony aggravated assault committed on Michael, the prosecutor just turned his head and acted as if he had not been asked a question. Michael Lindsey endured multiple life-threatening injuries as a result of this Felony Aggravated Assault and was listed as a Priority1 Life Threat on the American Medical Response patient care report. Large hematoma with 2 cm. laceration on the forehead. 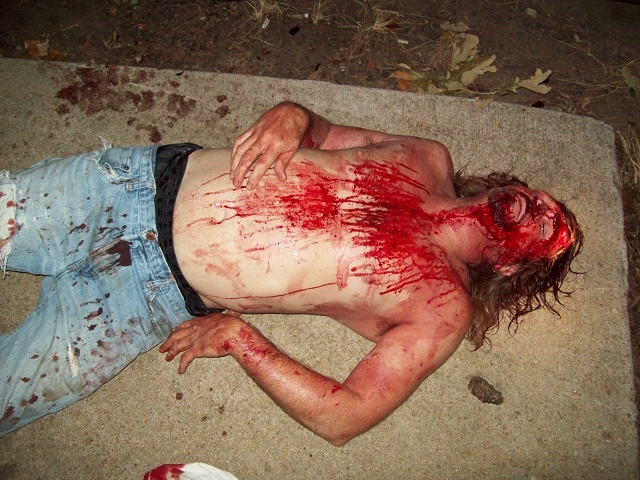 Multiple lacerations to the face (from a beer bottle this attacker brought with him to carry out this attack, busted it over Mike’s head then ground what was left in his face). The most severe under and coming up the left side of his nose that was 4 cm. full thickness with a 1 cm. laceration into the gingival. The hospital had to pick pieces of glass out of the roof of his mouth. Large hematoma on left flank (side). Partial collapse of both lungs. All within seconds (literally) of this attacker approaching Michael’s front door yelling I’m gonna kick the Motherfu*ker’s a$$. Law enforcement and the prosecution never acknowledged me as a witness. They even turned me away while I was sitting right there in the Police Department that morning by telling me “there’s nothing else you can do for him today.” When I asked if they could tell me what the charges were, I was told “There are no definite charges yet. All the witnesses are drunk, and we are waiting for them to sober up before we talk to them.” Yet they turned me away knowing I was the only witness who had not been drinking. According to the time on the warrant though, it was being issued at the same time I was being told there was no definite charges yet. Also at the time this warrant for murder was issued, they had interviewed only one of the drunk witnesses, turning the only sober witness away without asking her for a statement and had not received a report from even one of the five responding officers listed on the incident report. I was turned away and not acknowledged as a witness because Mike was screaming for someone to call 911 the whole time he was being attacked and he was being attacked at his front door blocking me from getting back inside to get my phone. I was trying to wake neighbors up to call 911 when Mike was finally able to get away from his attacker and stabbed him once to try to stop him. They didn’t need the eyewitness to the felony crime they were not going to acknowledge. It was as simple as that. I have taken a polygraph and passed that disputes the prosecution’s witnesses who were all drunk at the time of this incident. When the defense attorney asked the prosecutor if their witnesses would take a polygraph at the defense’s expense, the prosecutor refused. Crime scene photos taken by the police when they arrived on the scene of Michael laying on the ground covered in blood and unresponsive (as stated in the report of the first officer on the scene) were withheld from the defense by the prosecution and found purely by accident by the defense attorney. The defense attorney filed a motion to dismiss on grounds of Mississippi ‘Stand Your Ground’ Castle Doctrine. During this hearing, the defense attorney submitted the MEMO BRIEF IN SUPPORT OF MOTION TO NOLLE PROSSE along with the photos he found that had been withheld by the prosecution. The judge ignored that a felony crime had been committed on Michael at his front door and the fact that the photos had been withheld from the defense with the only comment about the photos that was something to the effect of he had seen worse. For three years, Michael Lindsey refused to accept a plea bargain. The week before his trial was to start, the prosecution amended the indictment to habitual (automatic life without parole if by chance he was convicted by a jury). Michael didn’t feel he would get a fair trial as the judge had already refused to acknowledge evidence and because of some trouble he had gotten into over 30 years before when he was a teenager. Even though the prosecution did this legally, it was more than obvious that this was done to try and force a plea from this victim (Michael Lindsey). After all, they could have indicted under habitual or made this amendment any time during the three years it took for this to go to trial, but they waited until the week before trial was to start. Well, this worked. Michael Lindsey made a best interest plea (which admits no guilt) under duress to manslaughter the day his trial was to start. On July 30, 2011, Judge William Chapman, sentenced Michael Lindsey to a term of 20 years in prison, with 15 to serve, and 5 years’ probation, under a Manslaughter Best Interest Plea, which admits no guilt. This is the maximum sentence allowed by law. Because I witnessed the worst thing I could have ever imagined in my worst nightmares, which has been totally ignored by those I was taught all my life were there to protect me, I will not give up of my fight to see justice is served for this victim of a felony crime.